"If someone asked me for the best race Kevin Schwantz ever rode, I would say Suzuka 1991"
An exclusive interview with MotoGP legend and 1993 world champion Kevin Schwantz. The Texan won 25 races during his premier-class career, all with Suzuki, which is returning to MotoGP this season. 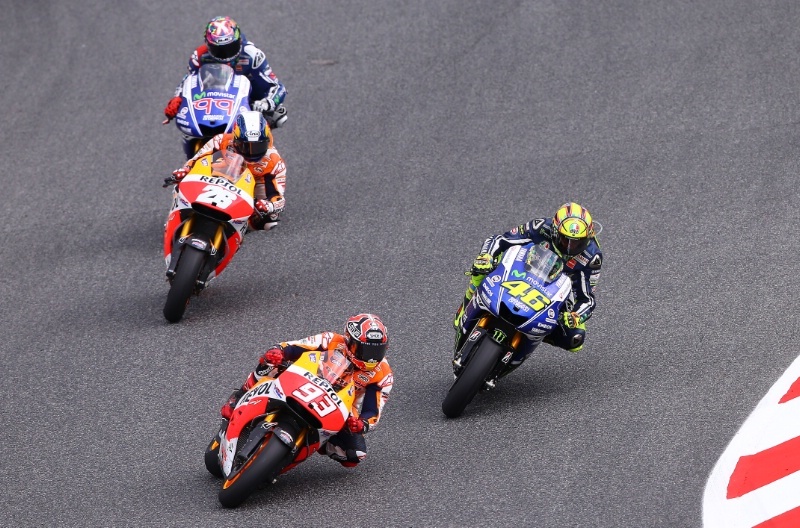 The big question heading into the 2015 season is whether Marquez and Honda can be beaten. What is it that you see Marquez doing better than the others? It just looks like he is putting forth a better effort over an entire weekend. He's getting that much better prepared for the racing. We saw at the end of last season he made some silly mistakes, like staying out in the wet too long instead of coming in to switch bikes, causing him to lose a bunch of points. But when you are two or three races in front of everybody in the championship you can try things like that. You can make little mistakes. What we didn't seem him do up to that point was make any critical errors in races. He was finishing, he was winning, and if he didn't win he was still at the front and usually on the podium. Marquez has shown a level of race craft that we haven't seen since Valentino was dominating. He has definitely got the better of his team-mate and, I can tell you, the one person that you can't stand to be beat by is your team-mate. So he's done a good job of consistently beating his team-mate and got the better of Rossi and Lorenzo early in the  season. Once you let a rider get some momentum going, they can just carry it from week to week. The team is obviously preparing him a great bike as well. We've probably got a couple more seasons until his younger brother Alex gets in the MotoGP class - then there will be two of them to deal with! For us Americans we've still got Nicky out there racing, but it can be tough to watch these days knowing there aren't any Americans fighting for the championship. Hopefully our new championship, MotoAmerica, will get manufacturers back involved over here and create that pipeline to get American riders back involved in grand prix. We used to dominate the sport in the '80s and '90s so it's tough to listen to the Spanish and Italian national anthems every week - everything else but the American anthem it seems like! It's funny because I'm sitting in the office looking at a picture of the 1989 Yugoslavian Grand Prix. It's Rainey, Lawson and myself on the podium. An American one-two-three. I was at the front at the end so of course I really like that picture! It's been so long since we've had Americans racing at the front of the class consistently and threatening to win world championships. So we've got to do something. I'm not exactly sure what the answer is. 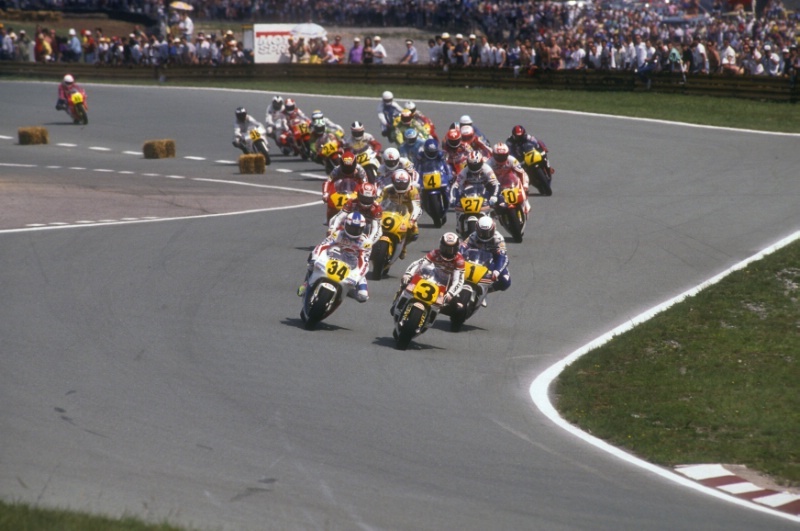 Rainey (6), Schwantz (34) and Lawson (1) lead 1989 Yugoslavian 500GP (Pic: Gold & Goose). America may not have riders fighting for the title but you do have two MotoGP races, including your home event at COTA, which you are an ambassador for. This will be the third year of the Texas race, how would you say it is developing in terms of awareness and interest? You know I think we are still trying to get the crowd from here in Austin. We've got the international crowd coming. We've got the national crowd from outside the state coming. What we are struggling with from an attendance standpoint is getting the locals - the Austin, the Dallas, the Houston, the San Antonio people - to come up and support the race. I've been the two-wheeled ambassador for the past twelve months now and in local restaurants and places when I'm talking about grand prix racing, people will say 'what is that? Where?' It's amazing that after all the news that the track made being built and getting Formula One and MotoGP, there are still so many locals that don't know about it. There are so many Texans that are like, 'what? When does that happen? What kind of race is that?' They still seem to be a little bit unaware of what a top level series MotoGP is and what Circuit of the Americas actually brings in with Formula One and MotoGP. This weekend we've got the Pirelli World Challenge and I bet 75% of the city doesn't even know that event is going on. So we've got some work still to do, but it's improving each year. 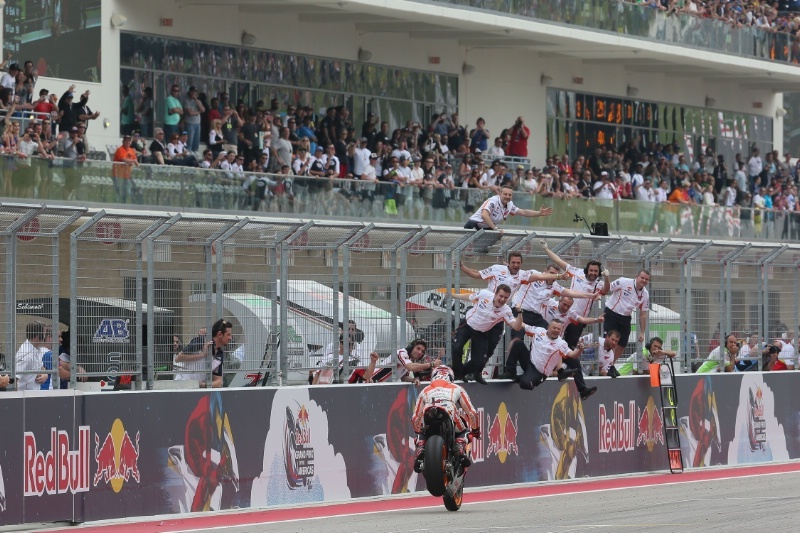 Marquez wins 2014 Grand Prix of the Americas (Pic: Gold & Goose). Yeah he's made racing at the front here pretty boring in terms of the premier-class that's for sure. Hopefully Lorenzo doesn't feel the need to jump start this year. That was kind of the beginning of the end of Lorenzo's season. He was lying on the ground in the first race so he gave up points there and then he gave up more points here. Marquez has just kind of made this place home for himself. Like you said pole positions, fastest laps, winning the races, beating his team-mate. Hopefully testing in Sepang has gone better for all of the other competitors and hopefully there is a bit more of a race at the front this year. Who do you think is most likely to take the fight to Marquez this year? You guys have been there and seen testing, but just looking at the lap times it looks to me like Marquez hasn't lost that consistency over the others. We won't know for sure until they wave a flag at the start of the race in Qatar - even then you can't really say a lot because that race happens at night and it's a different kind of track and surface. Until they race here in Austin I don't think we'll really know how the championship is going to unfold, in any of the three classes. 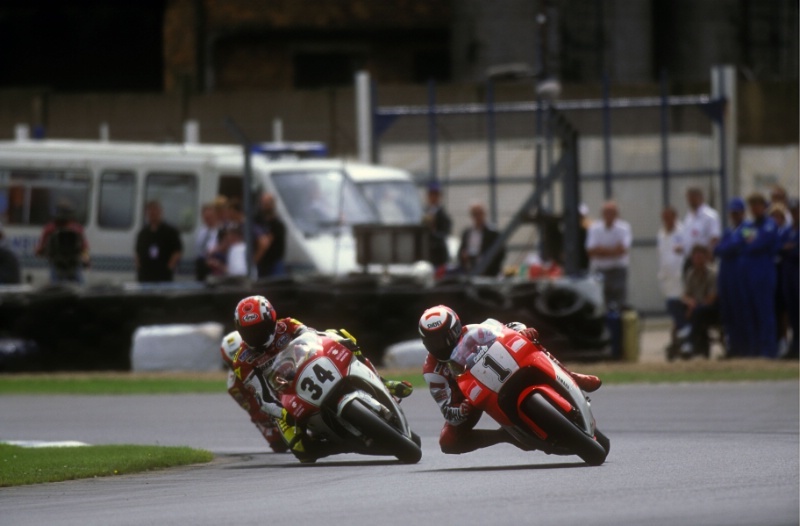 Schwantz and great rival Wayne Rainey, 1992 British 500GP (Pic: Gold & Goose). You raced against some great rivals. What would you do to try and beat someone like Marquez - a champion at the top of his game, on arguably the best machine? Are there any tactics you would try? In my opinion and what I used to do to race somebody who I thought maybe was better than me that weekend, was just to use every opportunity I had to get in front of them. Even if it was a banzai move up the inside to get past them on the brakes. Because if I never got in front of them, the chances were that they would just continue to ride away and dominate like they had all weekend. If I could get in there and upset their rhythm a little bit, maybe stay in front of them for at corner two. They would then pass me back and I would just immediately try to get back in front of them. It's something that I see Marquez do when someone passes him. He immediately tries to pass them back. You know, 'if I'm in front, you've got to find a way around me'. Sometimes it worked for me and sometimes it didn't. But I always felt like if I was at the front of a race, or in front of the person I thought would be the most difficult to beat that weekend, at least at that moment in time I was winning. If you just follow, follow, follow you're just going to watch that lead continue to grow and probably end up getting beat anyway. Why not try? I think the machinery has a lot to do with it, the electronics and everybody on the same tyres. It's kind of made racing a little bit less exciting, or I guess we can use the word boring. Because you start with something that is so similar to what you are going to finish with. You may lose a little bit of grip as the race goes on, but the bikes have got so much more consistent with the electronics and the ability to monitor and stop wheelspin, stop this, stop that. It's taken a lot of the rider out of the equation. But the manufacturers are involved in grand prix racing to try and develop stuff and make it better for the consumer. In the end ultimately that's what they are doing. Schwantz on his way to victory in the 1993 500cc World Championship (Pic: Gold & Goose). You raced in open tyre competition, but do you think the change from Bridgestone to Michelin in 2016 could shake things up a bit? I would like to think that it could shake things up a little bit. The thing is it's still going to be the same tyre for everybody. When we raced even among the Michelin competitors - whether it was a Yamaha team, a Honda team or a Suzuki team - 9 times out of 10 we didn't choose the same Michelins. They'd use a softer tyre, we'd use a tyre that we felt would be more consistent. Different riders want different tyres. I think trying to save money by having just a single tyre manufacturer has really taken a lot more from the sport than it has given to the sport. I think the money that they are saving maybe we are losing in spectators because it's dumbed down the racing. It's made the racing more boring. To be able to watch a Rainey start a race on Dunlops, that we all knew heated up really quick and were great for the first half of the race but would fall off a bit at the end. You didn't mind giving up four or five seconds to him at the start, because you knew in the second half of the race you could make that time up. But you sure didn't want to try going too fast, too quick on those Michelins because you'd be dusting yourself off in the gravel. Marquez, Rossi, Pedrosa and Lorenzo. 2014 Catalan MotoGP (Pic: Gold & Goose). Talking of the 500s, there is only one guy left on the present grid to have raced a 500, and that is Valentino Rossi. If you put the entire 2015 grid on 500 two-strokes, do you think the same guys come out on top? I think once they figured out that there weren't the electronics there to help them, I think the same group. The cream would still rise to the top. You'd see Marquez, Lorenzo and Rossi at the front of the field. I don't think you would ever have seen a Pedrosa at the front of a 500 field though! 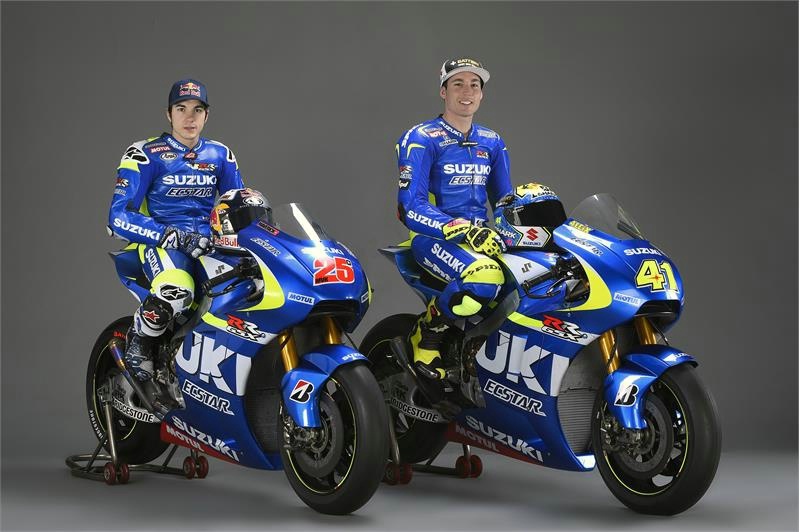 2015 Suzuki MotoGP riders Aleix Espargaro and Maverick Vinales. It has and how they catch up I'm not sure. It's so difficult now with Dorna controlling testing. Everybody asks me 'what did you do for training?' Man, we were testing! If we weren't racing, we were testing and that's the best training you can possibly have. We'd also be in the gym, on a bicycle, riding motocross or dirt track but that was for fun. It helped a little bit with training for racing, but the best possible training - and the only way to improve the machine or improve the rider - is to test the race bike. It'll be interesting to see if with their test team and all the advancement they have in Japan, whether Suzuki can actually catch up. Because right now it seems so controlled that it could be really difficult. Maybe it's not going to happen this year, but maybe in 2016 when there is a fairly big change to the rules with the electronics and tyres. Maybe that helps everybody. I'm not sure. But if you asked me right now to look and see what my little crystal ball says we have in store for Suzuki, I'd like to think that those two kids they've got riding for them, Espargaro and Vinales, can continue to develop a motorcycle even over the race weekends and can fight for the podium somewhere, sometime this year. And if the conditions are right, a wet-to-dry or dry-to-wet race, maybe they can make the pit stops in a timely fashion and maybe even have the opportunity to win. I think it would have to be unusual conditions like that for them to really shine. But who knows. I hope they surprise us all and are super-competitive even earlier in the season than I'm expecting. Jack Miller at Sepang MotoGP test (Pic: Gold & Goose). Apart from Vinales, who are the other young riders that have caught your eye? Well I think we all have to say Jack Miller is probably the attention-getter right now, and the younger Marquez. Both of them. Someone else who's been in the MotoGP class and that I'm looking for big stuff from this year is Scott Redding. I really feel like Scott is going to have a better machine than last year and we can see some pretty special stuff from him. With Jack Miller it'll be interesting to see when we actually stop testing and start racing, where he is at. Where he plays out in the field. And then kind of watch him as he continues to develop into a MotoGP rider throughout the season. And then the two Suzuki guys. Aleix Espargaro has been around for a while and he showed last year on the Open Yamaha that he can rattle the field a little bit upfront. Hopefully he and Vinales are going to work and push each other and continue trying to develop that Suzuki. I'm hoping for big things from both those guys. Aprilia is also going to be exciting to watch to see how they come up development wise. They've got some almost-young speed in Bautista and someone with a lot of experience in Melandri. Hopefully their testing and development process continues and they can be competitive somewhere throughout the season. 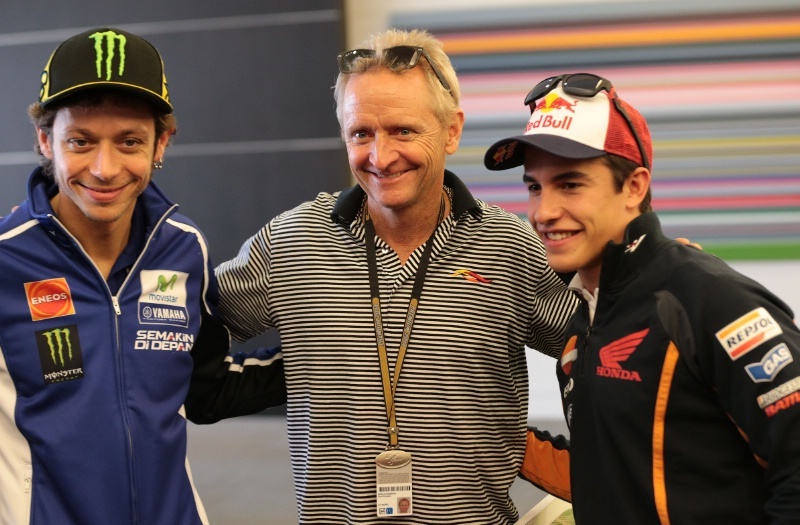 Schwantz with Rossi and Marquez. 2014 Grand Prix of The Americas (Pic: Gold & Goose). The oldest rider on the grid will be Rossi, still going strong at 36. How impressed are you by that and what do you think is the secret? I think Rossi's the only guy out there that still has fun doing what he's doing. He doesn't take it as a job and I think Marquez has a similar attitude. Whether it is the media side of things, the sponsorship side of things or the actual racing you've got to tell yourself, 'I've got a job racing motorcycles that pays me quite well'. Every day I was able to get on a motorcycle when I was racing professionally it was like, 'you are kidding me! How much more blessed can I be to have this job?' I think so many riders look at it as work. You know what? Go do a normal job every day and you'll know what the definition of work is. So I think it's Rossi's approach: 'I'm still doing it, I'm still competitive and I'm still having as much fun as when I first rode a grand prix bike'. You know I first watched Rossi when he was racing pocket bikes at a little go-kart track at Misano in 1989 when he was 10 years old. A friend of mine called Aldo Drudi [who now designs Rossi's helmets] said to me, 'you've got to come and watch Graziano's son race'. I really liked it because he wore a Schwantz replica helmet. It was funny because he and his team-mate were both considerably faster than the kids, but even then Rossi was that much better. I mean it was visible even on a little-bitty track and a small bike. He was going through the corners so much faster than the other kids. You wouldn't believe it. It's been interesting to know him from a young kid to the person he is now. What I see him doing better than everybody else is making fun of it. He's having a great time doing what he's doing and loving what he does. Would you say Rossi has changed much during all the time you've known him? Is he still the same sort of character and person? Oh yeah. Absolutely. He's one of the few that fame and fortune hasn't changed, that's the sure. 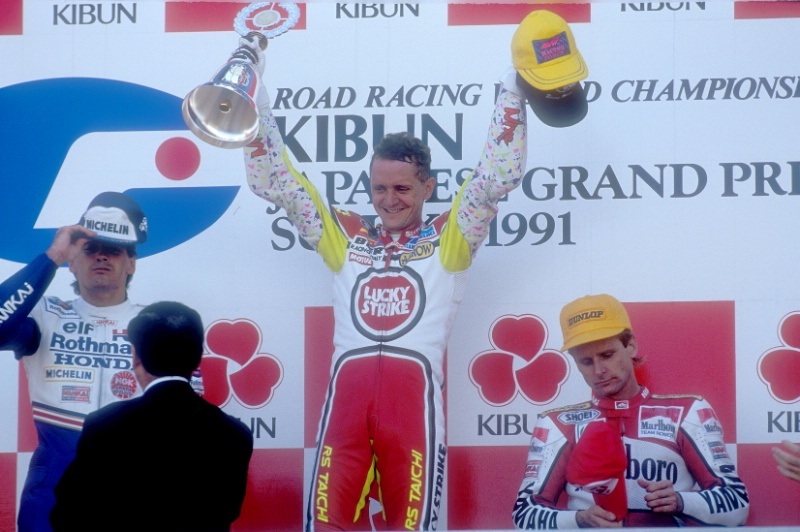 Kevin Schwantz's best victory: The 1991 Japanese 500GP (Pic: Gold & Goose). Looking at your own career Kevin, do you have a favourite race or a race that you are most proud of? 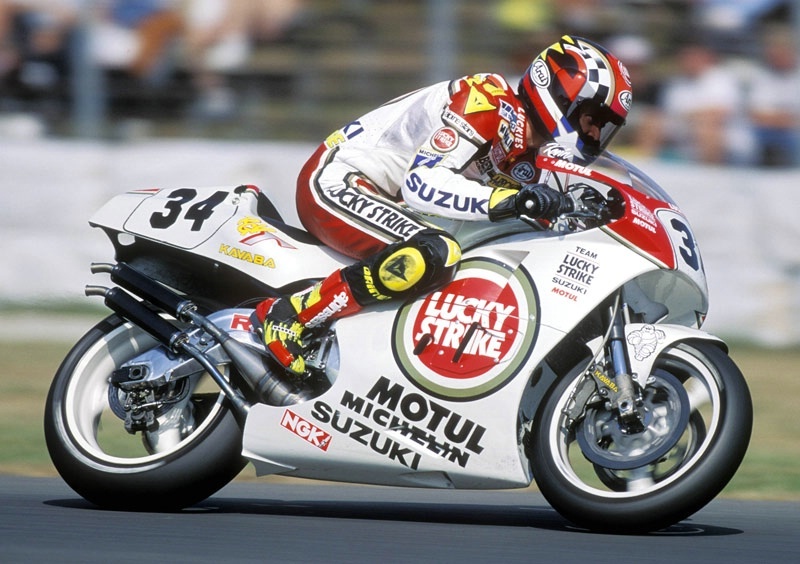 If someone asked me for the best race Kevin Schwantz ever rode, I would say Suzuka in 1991. That was the year we used Dunlop tyres because Michelin were only supplying the factory Hondas. We'd been to Laguna, Jerez, and a million different places for testing and were just horrible everywhere. And we weren't great in practice or qualifying for that first round in Japan either. In the race I got a good start and got to the front, then went back to sixth or seventh place. But as the second half of the race came around the fuel burnt off, the front quit pushing and we were the best bike at the end when it counted. I managed to make a couple of key passes on the last lap to win that race. It was against Rainey and a bunch of other competitors including Doohan, Kocinski and some Japanese riders. Wayne and I have a lot of great battles, but that to me is the battle where it was more than just him that I had to beat. It was four or five other guys. And as bad as we'd been in testing, I felt that we did the best that we possibly could as a team. Taking what wasn't a great bike at the beginning of the race and by the time it got to the end, when it counted, we were right there battling for a win and managed to pull it off. [Schwantz (Suzuki), Doohan (Honda), Rainey (Yamaha) and Kocinski (Yamaha) were covered by just 0.556s at the finish]. 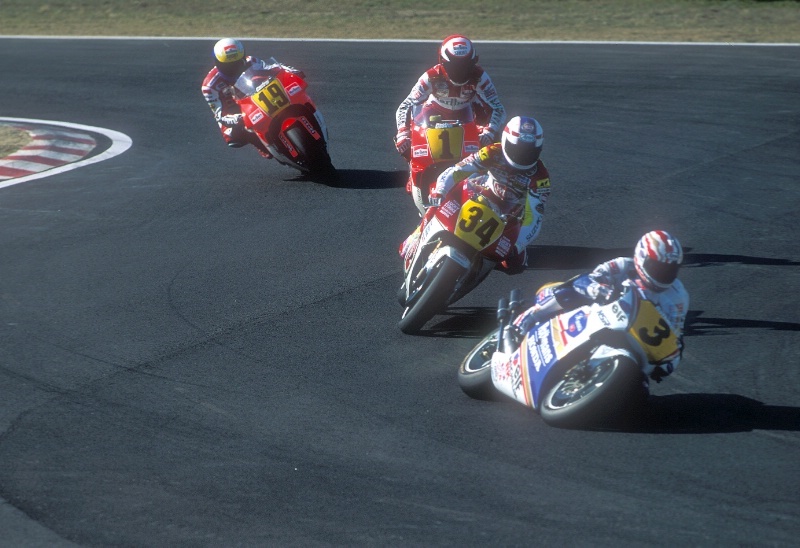 Doohan, Schwantz, Rainey and Kocinski battle at the 1991 Japanese 500GP (Pic: Gold & Goose). What about racing this year Kevin, are you doing the Suzuka 8 Hours again? As we speak right now I have no world championship racing scheduled. That's not to say that something might not come together for the 8 Hour. But as of right now, no, nothing planned. Just exhibition stuff and vintage bike racing. Maybe back to Goodwood for the Revival, there is the World GP event in Jerez, another event possibly in Japan. May, June, July are a little bit busy but as far as stuff where I've got to get on a bike and try and find world championship level - no plans right now. Hopefully that changes because I really would like to go back and do Suzuka again. Do you get out on a bike much just for fun when you are at home Kevin? We just had a big intro here in Austin with Suzuki's new GSX-S. A bike that has been out in Europe for a while. We had a big press ride a couple of days ago. Not great weather for it but we rode most of the day in the rain. But yeah, I've still got a KTM 350 motocross bike. I like riding on the track, I like riding in the woods. Every opportunity I get to go out and play involves something with two wheels. Whether it's my bicycle or motorcycle. I still enjoy riding that's for sure. Post by Kevin Schwantz - Official Page. Which of your former rivals do you keep in touch with? Do you enjoy catching up with them? Absolutely. I was in Japan for a Moriwaki function at Suzuka [in November] and Gardner and Crosby were there. It was great to see both those guys. I never really raced against Crosby but we did the Suzuka 8 Hours in 1985 as team-mates. Gardner, being competitors, we still have different opinions about different things in different races. But I probably keep in touch with my Australian buddies more than I do the American ones. Daryl Beattie and I still talk a couple of times a month normally, either by text or by phone call. I tell you who I saw at the end of last season was Mick Doohan, at Motegi [race weekend]. I used to not have much time for Mick but spending a week with him and listening to him and kind of hearing what life is all about now. He is a changed person from the Mick that I used to not have much time for. He is a great guy and probably always has been, but he never really gave us much of an opportunity to see that side of him. He is a much improved version of Mick Doohan, I know that! Circuit of the Americas (Pic: Gold & Goose). 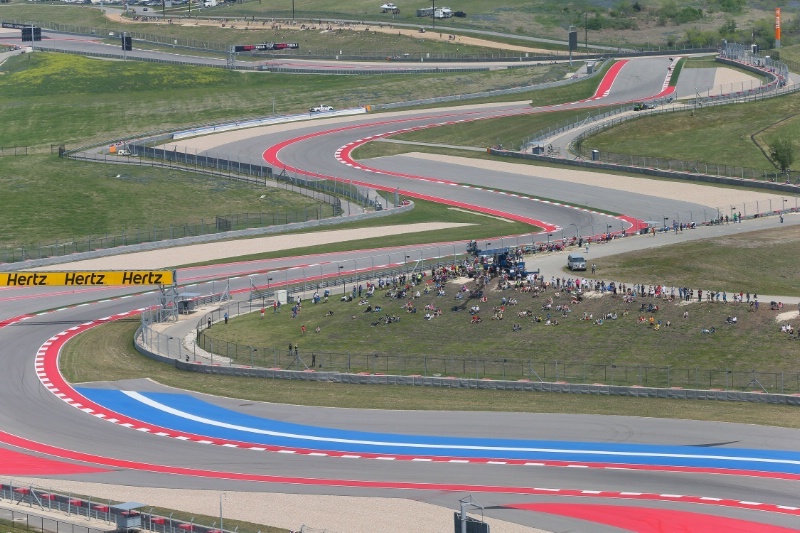 Last question Kevin, for fans attending the COTA MotoGP, where are your favourite places to watch from? The sequence of corners from Turn 3 to Turn 8. It's a really, really physical portion of the race track and I like watching people have to work to get a motorcycle to do what they need it to do. That sequence of corners coming out of Turn 2, which is a really fast downhill right hander, into a sequence of Esses, under the bridge. It's where you really get to see the good guys make it look easy. And you can tell if somebody is maybe going to have a hard time in the race, just because of how hard they are having to work in practice. You can't consistently do that in the race. You've got to work on the equipment to make your life a little bit easier. So I think if there is a spot on the track, it'd be that sequence of corners and also the big high-speed braking area after the back straight. Last year Marquez did 211 miles an hour into a corner that is either a long first, or a short second gear. That's a great place to watch also. Thank you and look forward to seeing you all in Austin. 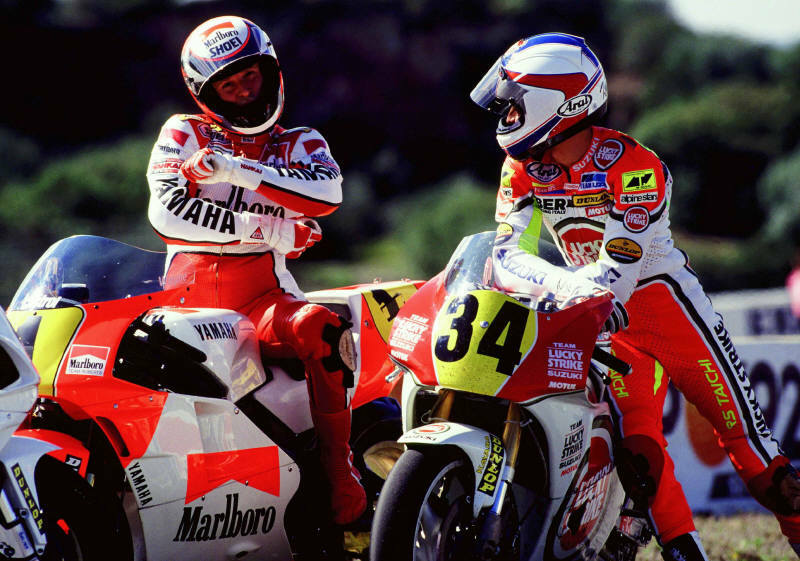 Schwantz and Rainey during the 1991 500cc season. (Pic: Gold & Goose). Your favourite motorsport babe for February revealed! Schwantz, Kagayama, Haga to race Suzuka 8 Hours!